In December 2007, the Russian "ice-class" ship Ivan Papanin left Cape Town, bound for Antarctica. The vessel carried the 120 containers with all the elements for the construction of the Princess Elisabeth station in East Antarctica. Onboard, were the Russian crew, a dozen military officers, one photographer, and two Belgian ornithologists. The ornithologists, Alain De Broyer and René-Marie Lafontaine (Royal Belgian Institute of Natural Sciences), travelled round-trip from Cape Town to Crown Bay, studying the Antarctic marine life with particular focus on birds and mammals (also called "top predators") for the international Census of Antarctic Marine Life (CAML). The CAML programme was developed by the Scientific Committee on Antarctic Research (SCAR) as an integral part of the global Census of Marine Life. By initializing a survey of Antarctic marine life encompassing the very small (viruses and microbes) and the very large (birds and mammals), this international research project will enable scientists to develop better protection measures for the world's ocean resources. What exactly is your contribution and that of the Royal Belgian Institute of Natural Sciences to the CAML project? How does this project fit into the framework of the International Polar Year (IPY) 2007-08? The CAML is an ambitious 5-year project (extending from 2005 to 2010) which is coordinating a vast "survey" on Antarctic marine species. Focussing on the species' distribution and abundance, CAML scientists are notably studying how current fauna and flora biodiversity has evolved in the particularly cold waters of Antarctica. While establishing current knowledge on marine biodiversity in the Southern Ocean, the objective is also to extrapolate results for the prediction of future environmental changes. Over 30 sea campaigns have been scheduled by the CAML during and after the International Polar Year. "Top predators", that is marine birds and mammals, are just one of the four target groups of our research, alongside microbes, plankton and benthos (ocean floor-dwelling communities). The Royal Belgian Institute of Natural Sciences has been actively researching Antarctic marine biodiversity for a long time. The Institute has also played an important role in the scientific "steering committee" of the Census of Antarctic Marine Life since its very beginning. The trip on board the Ivan Papanin offered an excellent opportunity to contribute to the project and collect data concerning the distribution and abundance of birds, whales and seals living within the boundaries of the Southern Ocean. Scarcely visited, there is very little information regarding this area. How many different species did you observe during your itinerary and which species did you see the most of around the Southern Ocean? The journey from Cape Town to Antarctica lasted 28 days. The ship spent 11 days in the open sea and 17 days in pack ice (3 days were spent bound to the ice shelf at 5° East to disembark the Norwegian equipment for the Troll station, while 5 days were spent in Crown Bay to unload the building equipment of the Belgian Princess Elisabeth station). All in all, we observed 65 bird species. However, this figure also takes into account 9 species bound to the South African coast and of no particular interest to our research project. That leaves us with 55 bird species seen within the Southern Ocean's limits, namely albatrosses, shearwaters, petrels, storm-petrels, diving-petrels and penguins. But we also came across 10 cetacean species and 4 seal species: whales, beaked whales, dolphins and orca for the first, and Weddell's, Ross, crab-eaters and leopard seals for the latter. Within the icy Antarctic Ocean waters, biodiversity is very limited. The species we encountered the most were Snow and Antarctic Petrels, Adelie Penguins and, as we moved into the continent, we also saw Emperor Penguins. Although less abundant than the species just cited, we regularly came across a few Southern Giant Petrels, Antarctic Skuas and the Wilson's Storm Petrel. Could you identify the most endangered species of the Southern Ocean along with the main causes for this? It is difficult to identify which are the most endangered species of Antarctica. Mainly, because we do not know yet how climate change is going to turn out affecting them. All of the species we have just cited depend on sea ice to some extent and are therefore directly threatened by climate change. However, climate change is not the only threat to biodiversity. For other "more northerly" species, such as the Albatross and certain Petrels, industrial fishing methods, such as the use of long-line fishing vessels, are most preoccupying. I refer you to the "Save the Albatross" campaign. To give you an idea, 100,000 Albatrosses die each year due to this practice, and 19 out of the 22 species of Albatrosses are seriously threatened with extinction. The better we know their distribution, the better we can protect them. Albatross and petrels generally have a slow population growth, due to the fact that they only lay one egg per year, sometimes even only every three years, like the Wandering Albatross for example. While the slow population growth is somewhat compensated by longevity, "holes" in the generation pyramid arouse as adult individuals are fished. These generation "holes" are very long to recover due to the slow population growth. Were you in any ways surprised by what you encountered during your trip? We came across certain species of birds which had not been known to live in the area we covered. 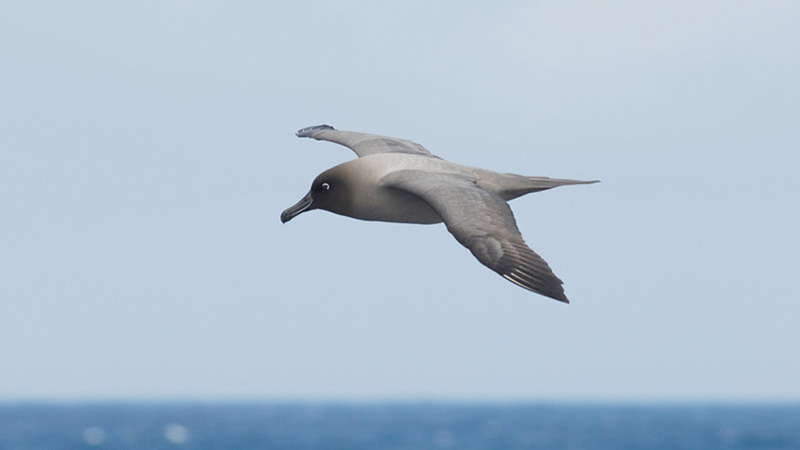 More specifically, we discovered that Diving Petrels could be seen near the Antarctic Convergence, far away from their breeding islands, and that the Long-tailed Jaeger could be found to over-winter between 40 and 42°S (they are normally seen during the winter around 35°S off the South African coast). We also observed several Southern Royal Albatrosses originally from New Zealand. Although they are well known to the area, the fact that we came across 5 individuals is an indication that the species is found regularly within the covered zone. We also had the opportunity to observe a group of 6 Arnoux Beaked Whales, consisting of 3 females and 3 youngsters. This was a rather rare observation given that we were outside the species' usual habitat range. Data in this region is rare because it is scarcely visited by ships and scientists. Our observations proved to be quite valuable. How will your data be used by the international Census of Antarctic Marine Life? This census should be able to establish a link between the presence of certain species and that of different water masses along the way. Given that the ocean is not homogenous, animal species spread out according to food availability. Diet specialisation therefore brings them to specific areas rather than to others. For example, various species are present in tropical and subtropical zones, like the Great Winged Petrel and the Shy Albatross in the Indian Ocean, and in sub-Antarctic areas, like the Sooty Albatross and Black-bellied Storm Petrel, etc. It is important for the CAML to consider the distribution and dispersion of top predators in conjunction with that of microbes, benthos and plankton. The more data there is to analyse, the better we will be able to define the way climate change is likely to affect them. If we can do that, we can also offer them better protection. Having said all this, one must bear in mind that our observations have not been processed yet. The data we collected during our trip is still being integrated into our computer models. The results of our observations should be ready for release towards the end of the year. And this should be able to bring us to further conclusions. Arctic Terns are known to migrate from the Arctic to the Antarctic sea ice for the austral summer... How can this phenomenon be explained? Is it of any relevance to climate change? Arctic Terns are, it is true, over-wintering within ice covered Antarctic areas. We saw some all the way down to the ice shelf's limit, around 70°S! During the Ivan Papanin's traverse, especially within the more icy areas, we regularly came into contact with small groups of Arctic Terns. Although this phenomenon has been known for a very long time, it is still very surprising for us, Northern Hemisphere inhabitants, to see these birds so far away from their nesting area! The Arctic Tern has actually been migrating to the Antarctic for a very long time, probably since the species exists. The reasons for such a long migration are hard to establish. Biologists believe this adaptation results directly from their food query. This is because more sufficient food resources are available down South, during the austral summer (which coincides with the Arctic winter). Having stocked up on energy during the winter, they can then migrate back to reproduce the following spring and guarantee a stable population growth. It often happens that a certain species of bird over-winters in a specific area just for its food supply availability. A bird species migrates there for its survival when there is food shortage in its area of reproduction. In the Arctic Ocean, we have seen food supplies go downhill for some time now. This reduction can reduce the Arctic Tern population but does not influence the species' migration route. They are forced to migrate anyhow, since it is not possible for them to survive the Arctic winter in such poor conditions of food supply. Many hypotheses have been suggested as to the influence climate modifications have on the over-wintering zones of the Arctic Tern. The dispersion of this bird specie throughout Antarctica will depend on the availability of food supplies such as krill (which also moves geographically depending on the climate). There is still an enormous amount of research to be carried out on the changes occurring in the Antarctic ecosystem before we can even begin to understand the consequences these changes entail for the Arctic Tern. The over-wintering of the Arctic Tern in Antarctica is thus a natural phenomenon which can be attributed to the adaptation of species. Although this phenomenon is not linked to recent climate change directly, climate change probably does have an undeniable influence on the dispersion of ice and food, and, in the long run, on the dispersion of birds around the continent. Alain has been an ornithologist practically since childhood. He is currently working for the Belgian non-profit organization Aves, and is participating in the Natura 2000. His resarch interests include identification of birds and the study of their life cycles (phenology). He spends lots of time conducting research in the field.